I don’t think I’ve ever seen a more perfect rendition of Princess Zelda from The Wind Waker than this one by Brazilian digital artist, yoshiyaki! Yes, you could argue that the 3D style doesn’t stay true to the imagery of the game, but that would be overlooking everything that this piece does so wonderfully. As in other installments of the franchise, there is a duality to Zelda in The Wind Waker that I think is captured spectacularly in this adorable rendering. 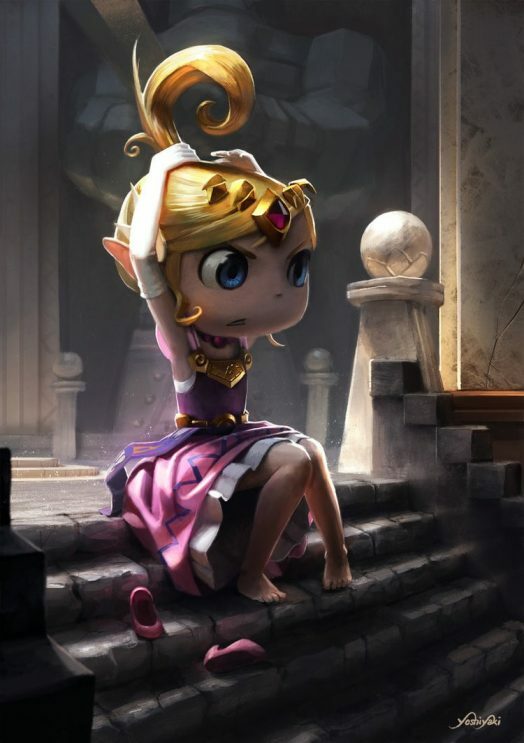 Dressed in her regal finery with a gem encrusted circlet crowning her head, she looks every part the princess of Hyrule; but her skirt hitched up, shoes kicked off, dragging her hair up into a practical ponytail, she’s clearly still the feisty pirate, Tetra, as well. I can imagine her grumbling something under her breath about having to do everything herself before swinging into action as her swashbuckling alter-ego. I can’t get over how beautifully the lighting is illustrated, casting an almost hallowed look over the great hall behind the princess and catching the highlights of her golden hair and crown magnificently. If Nintendo ever considered a ‘more realistic’ reimagining or remake of The Wind Waker, I’d be upset if it didn’t look exactly like this — updated as a beautifully rendered painting that maintains the cartoony style at the core of the original. Never change, princess, except maybe into something more suitable for the high seas.